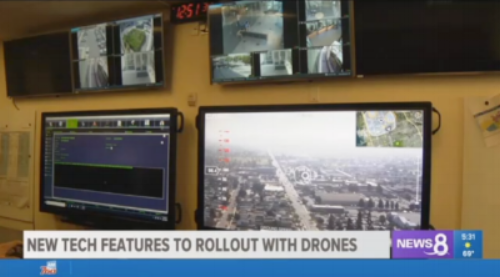 CHULA VISTA (NEWS 8) – Chula Vista’s mayor and FAA officials on Thursday announced a new test program that would allow trained officers to deploy drones during an emergency – taking their crime fighting efforts to new heights. The test program was possible through the FAA Unmanned Aerial Systems (UAS) Integrated Pilot Program (IPP). As part of the IPP, drones equipped with Cape Aerial Telepresence software will be deployed to a scene within two minutes from Chula Vista Police Department headquarters, to provide police with video and decision quality data. The drones will serve as first responders, assisting in incidents such as life safety, crime in progress, fleeing subjects, fire and more. Since the Chula Vista Police Department began operations on Monday, October 22, a drone has been deployed 29 times. About 30 percent of those calls were related to some type of disturbance and about 17 percent of the time, drone pilots were able to clear a call without ground units responding (e.g., the subjects were gone), thereby keeping officers free for higher priority calls. Other states and cities participating the drone program include: Kansas, Virginia, Alaska and North Dakota and the cities of Reno and Memphis.